Scientists have posted the first images of the new lava breakouts that began erupting this morning from the flanks of Puʻu ʻŌʻō. Big Island Video News. 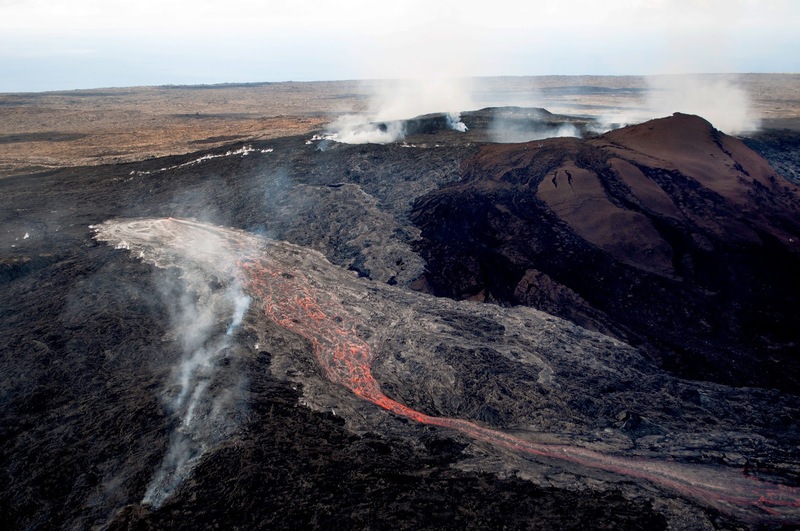 Lava began flowing in two directions from Kilauea’s Pu‘u ‘O‘o cone Tuesday morning. Tribune-Herald. Hawaii County Civil Defense and geologists at the Hawaiian Volcano Observatory are watching two new lava flows from the Puu Oo vent that began Tuesday morning. Star-Advertiser. President Barack Obama said Wednesday he plans to use his historic visit to Hiroshima with Japanese Prime Minister Shinzo Abe to reflect on the suffering of war and the need to take steps to prevent it. Abe said he had no plans to reciprocate Obama's gesture by paying his own visit to Pearl Harbor. Associated Press. NextEra Energy Inc.’s proposed $4.3 billion takeover of Hawaiian Electric Industries Inc. is looking less and less likely as the company gets a new chance to buy the largest power distributor in Texas, analysts said. Bloomberg News. The $4.3 billion merger deal between Florida-based NextEra Energy and Hawaiian Electric Industries is looking less likely to go through, analysts said in a Bloomberg story Tuesday. Civil Beat. Hawaiian Electric Co.’s announcement last week that it has reached an agreement with a subsidiary of Fortis Inc. for the Canadian electric and gas utility giant to supply the state’s largest utility with liquefied natural gas as a replacement for oil has surprised the other Hawaii utility looking to ship in LNG. Pacific Business News. A panel of experts charged with predicting how much the state will collect in taxes revised its estimate downward Tuesday by about $34 million for this year, but that isn’t expected to cause any great hardship in state government. Star-Advertiser. The Council on Revenues tweaked its state revenue forecast downward today despite numerous economic indicators pointing to an upward trend. Hawaii Public Radio. For the first time, former Congresswoman Colleen Hanabusa admits she's thinking about running for U.S. Rep. Mark Takai's seat. Hawaii News Now. State lawmakers passed two bills in an attempt to monitor and reduce the number of opioid-related overdoses in Hawaii. Star-Advertiser. To hear the state’s prison officials tell it, Hawaii is saving millions of dollars by sending hundreds of its excess prison inmates to the mainland. But a closer inspection shows that the deal isn’t as much of a bargain as it seems. Civil Beat. Rail board members are now openly questioning whether narrow Dillingham Boulevard would be the best path on which to build the island’s transit system heading into town, as the project faces huge costs and the community braces for the impacts of building through that crowded corridor. Star-Advertiser. Opponents of a planned tourist attraction with commercial hula shows and luau buffets amid gardens deep in Manoa Valley have a new opportunity to contest the project following a lapsed permit for the work. Star-Advertiser. Commentary: There’s no dispute that the 2012 general election was marred by widespread ballot shortages that caused confusion and delays at many polling places. Now the Hawaii Supreme Court will have to decide what, if anything, needs to be done about it. The court heard oral arguments last week in the appeal of a lawsuit brought by the Green Party of Hawaii and seven individual voters stemming from the 2012 ballot fiasco. Civil Beat. Rocks placed on the Mauna Kea Access Road on May 16 have rekindled tensions on the mountain, as state conservation officers seek a person of interest spotted on a Visitor Information Center camera. Big Island Video News. Hawaii state conservation officers are seeking a suspect who placed rocks on the access road to the Big Island's Mauna Kea. Division of Conservation and Resource Enforcement officers said in a statement Tuesday that a shirtless man wearing board shorts and slippers was captured on surveillance cameras just before the rocks appeared. Associated Press. Government officials at levels from Hilo to Washington, D.C., are calling for increased resources and collaboration to fight rapid ohia death. Tribune-Herald. U.S. Sen. Brian Schatz is pressing federal and state authorities to bolster efforts to eradicate the fungus killing tens of thousands of acres of native ohia trees on the Big Island, comparing the spread of the disease known as rapid ohia death to a large forest fire in scope and degree of devastation. Star-Advertiser. State land chairwoman Suzanne Case has approved an environmental review for a logging operation of non-native trees in the Waiakea Timber Management Area on Hawaii island. Star-Advertiser. The Hawaii State Ethics Commission announced Tuesday that it has resolved a complaint over Big Island Sen. Josh Green’s failure to disclose property he owns on Oahu. The commission decided to agree to a settlement in which the senator must pay a $300 administrative penalty, giving him a lighter penalty in large part because of his cooperation in the investigation. Civil Beat. Defamation, malice, and cunning. That’s how a Hawaii Island Humane Society response is characterizing a lawsuit filed in mid-April by Big Island Dog Rescue. West Hawaii Today. A Maui County Council committee recommended two proposed charter amendments and deferred three others Monday, as members began the task of whittling down nearly 20 proposals for November's general election ballot. Maui News. The Historic Hawai'i Foundation is recognizing four Maui County projects for historic preservation honors during its 42nd annual Preservation Honor Awards ceremony Friday in Honolulu. Maui News. A $135-million project to bring Coco Palms back to life is still moving ahead. After being told that funding for the project is in the bank, the Planning Commission unanimously voted Tuesday to defer its decision on demolition of the resort until June 28. Garden Island. An “SOS” drawn in the sand led to the rescue today of two hikers stranded overnight on the Na Pali Coast Trail on Kauai. Star-Advertiser. A couple was rescued on Kalalau beach Tuesday morning after writing a signal for help in the sand. Garden Island. Four victims of Monday’s plane crash at the Port Allen Airport have been identified by friends and family. Enzo Amitrano, Wayne Rose, and brothers Marshall and Phillip Cabe died in the accident. The pilot has not been identified. Garden Island. The Sunday discovery of 34 dead wedge-tailed shearwater birds near Kauai’s Spouting Horn remains under investigation, but officers with Hawaii’s Department of Land and Natural Resources still believe dogs are behind the killings. Garden Island.